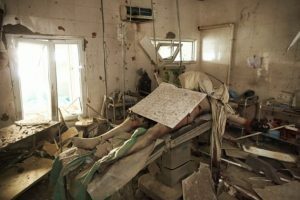 “The Man on the Operating Table.” A patient, later identified as 43-year-old husband and father of four, Baynazar Mohammad Nazar, lies dead on the operating table inside the Médecins Sans Frontières Kunduz Trauma Center in Afghanistan, following the 3 October attack by an American AC-130 gunship. © Andrew Quilty. ‘US forces conducted an airstrike in Kunduz city at 2:15am [local time] on 3 October against individuals threatening the force. The strike may have resulted in collateral damage to a nearby medical facility. This incident is under investigation,” said Col Brian Tribus, spokesman for international forces in Afghanistan. We are all collateral damage. in a dirty, visceral corner. in this cracked, demented earth. Enough grovelling in the charred shadows!